A few years back, one of the very first local hunts I discovered while trying to find the "perfect" chair was Urban Retreat Furniture Warehouse in Reston, Virginia. It is not like my usual local hunts that offers dirt cheap deals, but rather it is the very best alternative you could possibly have when compared to Pottery Barn or Crate and Barrel. 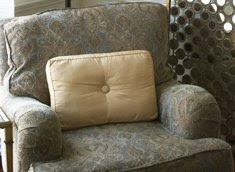 Their whole spiel is offering "low-cost, custom made residential furniture," with a multitude of fabrics and finishes to choose from. I can tell you from personal experience that they are great. Truly helpful and really give you your space while you're shopping. I don't know about you, but I absolutely HATE it when sales people are hawking me while I'm walking around. It's bad enough getting sensory overload when going into a store, but to have to have someone watching and asking you questions is just really annoying. I like to take my time and shop and when someone is asking me questions about what I'm looking for and how they can help me and what new promotions are going on, I just want to hurry and get the heck out of there! So rest assured, this place is one for the books! 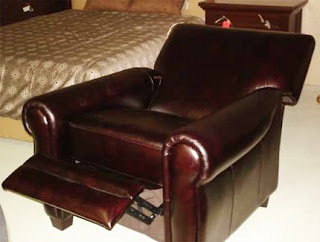 For those of you who are looking for a modern and fresh take on the recliner, here is a perfect example. I am loving both of these tables! The website doesn't have shopping cart capability nor does it have prices. But like I said before, they are really helpful so just give them a call or send them an email if you want to inquiry about a particular item from the site. That's exactly what I did and they gave me a price range on my chair since it's the fabric grade that you choose which determines the price. If you are in the market for something a bit more vintage-y and shabby chic, then this next locale is the place for you. Primitive & Proper is located in Severna Park, Maryland and offers home furnishings that have been refurbished giving it a shabby chic uniqueness. Not only are you getting a one-of-a-kind piece, but you are also getting incredible deals from them. Just see the prices below and you'll know what I mean. They were also featured on Daily Candy yesterday (8/3/2009). Check it out! I can see a beautiful capiz shell mirror hanging above this table. Can't you? And the following items are Custom Orders that clients have asked Primitive & Proper for, so they are not available for purchase. But this should give you ideas if you cannot seem to find exactly what you're looking for. 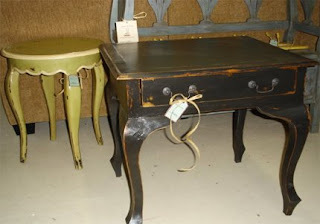 I would love to get my hands on this table but maybe in black or even red! I absolutely NEED this! Or at least one like it. What a great accent table and in such a pretty blue too. This Emily person sure does have good taste! 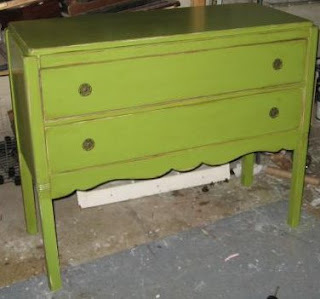 This green provides a nice punch of color - it will freshen up any room! All of these images better have stirred up your shabby chic side!